After the buds break in April there is always enough work. We get the canes in place, plant baby vines and – if necessary – burn fires to protect the young shoots or hunt caterpillars at night. In May it’s all about green pruning following the gentle pruning approach which we have introduced to all our vineyards. June is mostly about “managing” the leaves which mostly grow faster than we can get them in the wireframe. July is about fine-tuning the vineyards & bottling the good stuff. We always have a free room during that period. It’s the time of the year where we sleep little, work hard and burst of excitement about the new vintage. 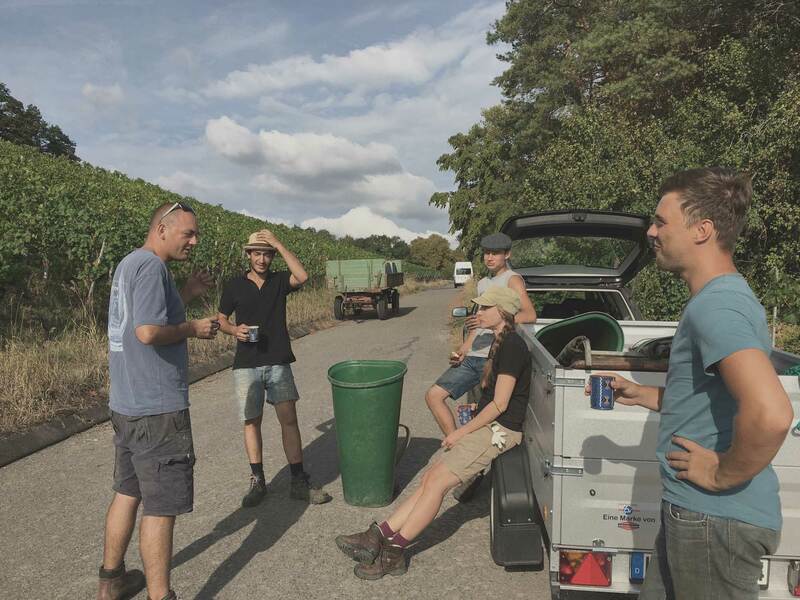 15+ hand-harvest days, bottling Pet-Nat, taking care of the skin fermentations, working with a newer pneumatic or an old basket press, stomping grapes, LOTS of cleaning and of course plenty of opportunities to drink wine. The full harvest-internship lasts for about 8 weeks: September / October. If you just want to help for a couple of days that’s an option too but our space is limited so we’ll have to find you a place to sleep in a hotel / pension eventually.